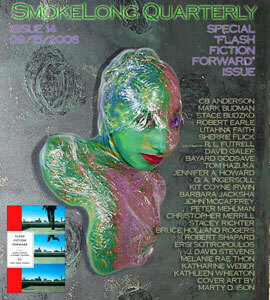 >With great thanks to Robbie Shapard, James Thomas, and all the writers, our special “Flash Fiction Forward” issue of SLQ is now live. Of the 80 authors in FFF, we were fortunate enough to be able to publish 24 in this issue, plus a piece by one of the editors, Robert Shapard. Great flash by CB Anderson, Mark Budman, Stace Budzko, Robert Earle, Utahna Faith, Sherrie Flick, R. L. Futrell, David Galef, Bayard Godsave, Tom Hazuka, Jennifer A. Howard, G. A. Ingersoll, Kit Coyne Irwin, Barbara Jacksha, John McCaffrey, Peter Mehlman, Christopher Merrill, Stacey Richter, Bruce Holland Rogers, Robert Shapard, Ersi Sotiropoulos, J. David Stevens, Melanie Rae Thon, Katharine Weber, and Kathleen Wheaton, with cover art, as always, by the inimitable Marty Ison.